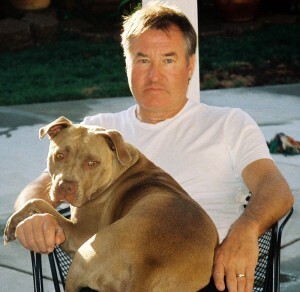 Chris Dangerfield, with pit bull Misstea, in the California sunshine. Chris Dangerfield’s office at his beautiful home in San Jose, California is packed with photographs. Amongst the glitterati on display are Pele and Cruyff and, closer to Wolves fans’ hearts, Barry Powell and Jimmy Kelly. Most poignant of all, though, is the image of Dangerfield sitting on a sofa alongside George Best, each holding their young sons (Michael and Callum). For Lyndy Dangerfield is sister to Angie, wife to the mercurial and very much-missed Georgie. Mrs Dangerfield makes a mean cuppa but it was hard to find time to drink it as Chris’s phenomenal recollection spun its way down memory lane. Dangerfield’s brother got him playing Sunday football, and he would score hatfuls of goals in men’s leagues at just 14. He had try-outs for the England boys’ team and his dream of playing for his heroes at Molineux came true when he travelled on Tuesday and Thursday evenings to train with Tony Penman at Castlecroft. He was doing his ‘A’ levels when he convinced his parents to let him sign professional forms for the Wolves. Dangerfield developed well under the tutelage of the likes of Norman Bodell and Brian Owen and he credits the latter with getting him into the England youth side for three caps in 1973-1974, alongside the likes of Steve Powell (‘sideburns down to his knees’), Dave Swindlehurst, Richie Powling and, in goal, Paul Bradshaw. “I played left-wing in those days, even though I was right-footed,” he added. “I never really got anywhere near the first team, although I did get one of those VWs with the club name on the side! Chris’s memories of McGarry are ‘not fond.’ He looks back rather more warmly to the likes of Steve Kindon, with whom he would visit speedway, and especially Derek Dougan. Another Villa diehard, Vic Crowe, who was managing Portland Timbers in the North American Soccer League, was looking for recruits for the 1974 summer and took five players on loan from Wolves – Peter Withe, Kelly, Gardner, Powell and Dangerfield. From 1974-76 in Portland, Chris enjoyed great success interspersed with his time in the winter months at Molineux, reaching a Soccer Bowl final in 1975. Remarkably, McGarry did not see fit to continue Dangerfield’s contract when it expired at Wolves in 1976. “Vic Crowe’s assistant, Leo Crowther, recommended me to Ron Wylie, who was assistant to Gordon Milne at Coventry and I played a full season in the Sky Blues Central League team and we finished runners-up to Liverpool. “Jimmy Hill offered me a two-year contract to stay but Derek Trevis wanted me at Las Vegas Quicksilvers and said he would play me. That’s what mattered. “People often seem surprised I would choose to make my career in the States but it was amazing playing with some wonderful international superstars in front of crowds like the 30,000 we would get in Portland. That’s better than in front of a few hundred on a cold night away to Huddersfield Reserves! Dangerfield was not entirely done with English football. 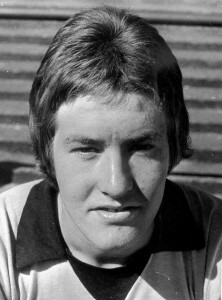 He made two substitute appearances for Roy Sproson at Port Vale before joining Coventry. Later, he played for Geoff Hurst at Telford. 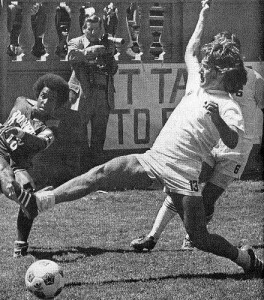 Dangerfield attempts a block against Tampa Bay Rowdies while wearing the white of Portland Timbers in 1975. It was an exercise in keeping fit for his career in the United States, where he realised his long-term future lay. Chris smiled when pointing out he also played for Chris Tarrant’s Tiswas XI alongside the likes of Jasper Carrott, Ron Atkinson, Robert Plant and Bev Bevan for charity. As is the norm for players in the States, there was lot of moving around for Chris Dangerfield, so he included Team Hawaii, Tulsa Roughnecks, California Surf, Los Angeles Aztecs, San Jose Earthquakes, Golden Bay Earthquakes and Minnesota Strikers (the latter two indoor) among his other employers in a 17-year professional career. The highlight was the Aztecs, alongside Johann Cruyff under the coach Rinus Michels. On retiring from playing, Dangerfield headed back to San Jose and in due course established his existing business, which recruits software engineers into Silicon Valley companies. He has come a long way since the days when he was responsible for cleaning the boots of Dougan, Mike Bailey and Dave Wagstaffe (“Waggy was a great help – he would come back in the afternoons and coach us,” he says). Now 54, Dangerfield is himself a coach, running the School of Excellence for De Anza Force in the US Soccer Academy. And there is quite a success rate, with 90 per cent of the young players making their way to colleges and universities. He is clearly fulfilled. Posted on: Sunday, April 4th, 2010.